A new exhibition of Schiaparelli and Thirties Fashion opens tomorrow, 8 October at the Gallery of Costume, Platt Hall. The exhibition will show 25 pieces, exploring the fashion of the 1930’s and highlighting the work of Elsa Schiaparelli, the most significant female couturier of the period. Elsa Schiaparelli (1890-1973) is celebrated for her creativity both as an artist and as a fashion designer and is regarded as one of the most prominent figures in fashion between the two World Wars. Schiaparelli’s love of bold designs, inspired by the Dada and Surrealist art movements, directed her into a new creative territory of fashion design. These bold designs distinguished her creations from her rival Coco Chanel, who referred to her as ‘that Italian artist who makes clothes’. Schiaparelli collaborated with a number of contemporary artists, most famously with Salvador Dalí, to develop a number of her notable designs. This flair for memorable artistic clothing made Schiaparelli popular with many important clients such as Duchess of Windsor, Wallis Simpson, heiress Daisy Fellowes and actress Mae West. The exhibition is curated by Miles Lambert in three main themes – ‘the shape of fashion’, ‘dramatic thirties prints’ and ‘bold embroidery and embellishment’. The exhibition will feature designs by other prominent 1930’s couturiers including Mainbocher Modes, French fashion designer and President of the Haute Couture committee, Jeanne Lanvin and a relation of Schiaparelli, Bianca Mosca. 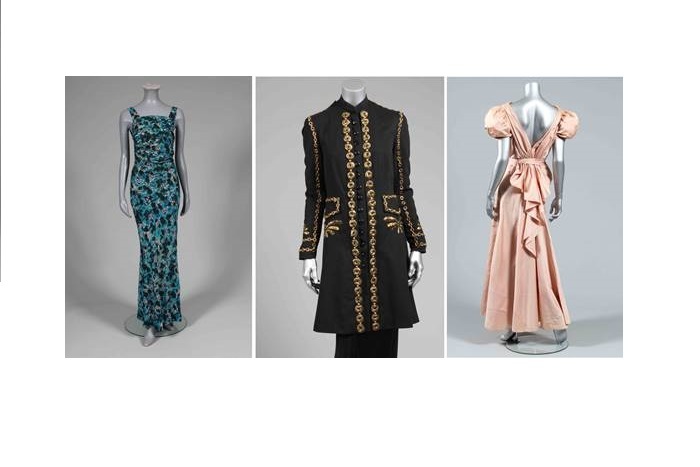 Highlights of the pieces on show include Schiaparelli’s embroidered tunic in fine black wool with raised work in gilt strip rosettes and square brass beads (1937), Jeanne Lanvin’s sleeveless evening gown in silvered crepe, with matching short-sleeved bolero jacket (1937) and an evening gown in purple satin-backed crepe by Mainbocher Modes with a ruched bodice (1936-38).